Welcome to Mama Cribs, a new FM Journal series where we shine a light on the gorgeous homes inhabited by inspiring mothers. Pastels and fun reign supreme inside the Playa Vista crib of Fashion Mamas LA member Pamelyn Rocco. 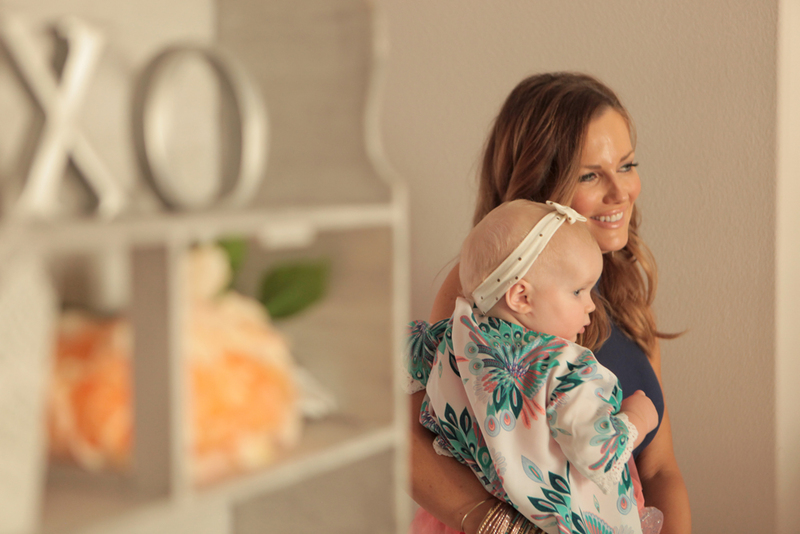 Mother to daughters Moorea and Harlow, Pamelyn and her husband Chris recently traded in their Marina del Rey digs for a home that would accommodate the needs of their growing family and Pamelyn’s growing business, Bashery & Co. — an events, party-planning, and decor rental firm. Beachy-glam with a touch of femininity along with Pamelyn’s love of color can be seen in every corner of the home, especially in our favorite area: the children’s playroom. Below, Pamelyn welcomes us into her house and shares her tips for keeping it tidy. She also reveals how to create a fun, impromptu bash with little ones. We live in Playa Vista. The sense of community and walkability initially attracted us to the area when we were pregnant with Moorea. It's a dream to live here. There are dozens of parks and we can walk to restaurants, the movies, and Moorea's favorite ice cream shops! I love pretty and feminine things, and that is reflected in my decor personality. I love a bright, crisp and clean look. I don't like too many things going on at once, but a little pop of color or pattern always works. What changes have you made inside your home as your family life evolved? We co-sleep with my eldest; and, she has decided that she is staying in our bed until she is 5! So, we only have a nursery for our youngest, Harlow. I love to mix different styles; so, it is a blend of Restoration, vintage and boho-chic. What is your must-have nursery item? The Dock-a-Tot is my go-to item. My daughter Harlow gets cozy and sleeps like a lamb, which allows me to get so much work done. Dock-a-tot, I love you! The Playroom. When we bought our house, we were able to renovate the entire home. I had a vision of this beautiful playroom that would be chic, comfy and inviting to adults as well. I knew we would be spending a ton of time in the playroom, so I wanted it to be for us too. We have our toys, craft table, pretend kitchen, bongos, mic and amp, huge TV and my favorite purple velvet couch from Anthropologie and a beautiful buffet that I use as toy storage. The kids get to play, my husband gets his TV and bongos, and I get my cool aesthetic! So, everyone is happy! What is the personality of the playroom? The playroom is attached to the open concept living/dining/kitchen, so I wanted the colors to flow together. Everything revolved around the fabric I chose to reupholster the vintage wing back chairs for the dining room. Light purple, turquoise, yellow — and of course, white and grey! What are some of your favorite things to do with your children? We love to make things! Our craft table is probably the most used item in our house and you can tell! We craft our asses off whether it’s painting or building with clay or glueing together everything imaginable or helping me with projects for parties. What is your advice for keeping a tidy space? Oh my! I try to make sure everything has a "home" and that everyone knows where that home is. My husband is great — every night after we put the girls to bed and I go to my office to work, he puts on ESPN and cleans up the kitchen and playroom, which helps so much. What is one of your favorite family rituals or traditions? I like to turn random nights into a full-blown toddler rager. We set up a performance area and dance floor in the playroom and let loose. Moorea is the Creative Director and gets to choose the playlist, which costumes we wear (we have a little costume rack that is full of accessories, props, tutus, hats — you name it), who is the main singer and who is backup (we have a real amp and mic set as well as a wireless mic). I will try to use special decorations that go with the theme. We set up chairs in front of the performance area to provide a concert feel. One night it’s country and she's jammin to Chris Stapleton's Tennessee Whiskey and we are all in cowboy hats playing our guitars; or the next night it's Justin Timberlake and we are wearing Trolls wigs and dancing with a life-size Poppy. Or sometimes, it's Bruno Mars and I pull out the bell bottoms, sunglasses, and fur and we kick it to Uptown Funk.